This website is currently being developed by e³rd electronics and is an ongoing development project. If you find something that doesn't quite work properly, please tell us! The Friends of Bracken Hall Countryside Centre cannot guarantee that any event or activity we directly provide will actually happen as stated in promotional literature or even at all! We operate on minimal costs and a small number of volunteers to maintain our schedule and try hard to ensure a full and varied programme throughout the year. This website is usually the best source of last-minute updates for guidance. Also, you can contact our Chair or Secretary if required before or on the day of an event or activity. Website content copyright The Friends of Bracken Hall Countryside Centre unless explicitly credited otherwise. If you submit content to FoBHCC you imply that we then have the right to unrestricted fair and reasonable use of your material unless you explicitly state otherwise. If you wish to be publicly credited for your content on the site, please state at time of content submission. Visit the Content Submission page for more information about content submission. We gratefully acknowledge copyright of the images used on the Birdsong project page to Mike Langman, rspb-images.com. Our programmes and other documents are usually available for download. Where possible, we make available two formats - one is the full colour version (as visible on screen) and the other is a monochrome version that uses less ink or toner thus saving you money! This website does not create or store cookies on your computer. This website is designed to run on modern browsers such as Google Chrome and Internet Explorer 11 onwards. On Internet Explorer 8 under Windows XP, there may be some visual errors but the site should still work. The site has also been used on Android 4.2 devices and Apple iPhone and appears to work OK. If a page or document fails to load and you get the '404' error - try refreshing your browser as a first step. It's the little circular arrow symbol somewhere near the browser address bar on most browsers. If this does not help, please go to the contact page and send the WSM a message detailing the problem. All original designs are copyright Friends of Bracken Hall Countryside Centre unless stated otherwise. 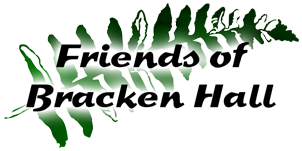 Friends of Bracken Hall logo © e³rd electronics, 2014-2019. Website design © e³rd electronics, 2014-2019.